This Methodist Church (circa 1898) was funded by Hearsts and associated with Phebe Hearst, the mother of the magnate William Randolph Hearst Jr. (he was born 1863, died1951).... 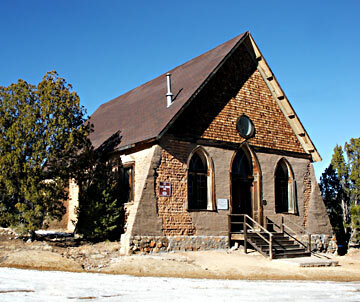 The Church was built some 14 years before New Mexico became a State. The Hearst family spent time in the area near Silver City. The family owned the Hearst gold mines near Pinos Altos, and the gold used between 1922 and 1939 in the construction of the well-known Hearst Castle Estate in San Simeon, California was mined in their gold mines. 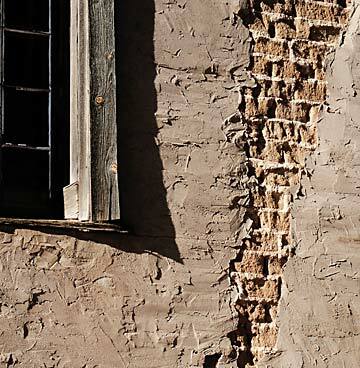 When this photographer was hiking the hills near this Church, gold was easily still found in old mine debris. Down the hill from the Church is historic Fort Cobre. 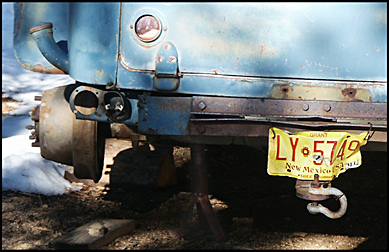 Below, an aged truck with the classic old New Mexican license plate. At the top of the plate, it says "Grant." At the bottom is the wonderfully true "Land of Enchantment."